If you are searching for an alternative fuel source for your forklifts that can save your business money and positively impact the environment, propane is just the solution you need. Propane is the most commonly used alternative to gasoline and diesel on a global scale. Approximately four million vehicles worldwide and over 350,000 vehicles within the United States alone operate on propane gas. Propane is also a popular alternative fuel source for material handling equipment used in commercial and industrial applications, powering approximately 670,000 forklifts in warehouses and factories throughout the country. Making the switch to propane will greatly benefit for your business, the environment, and the country as a whole. A few of these benefits include saving money on overall cost of ownership, reducing emissions, and creating energy security for the nation. Want to learn more about how you can cut operating expenses and emissions by switching to propane for your industrial needs? Read on for more details. If you are looking for a way to cut operating costs, it is time to make the switch to propane-powered forklifts, which will save your business money in both the short and long term. 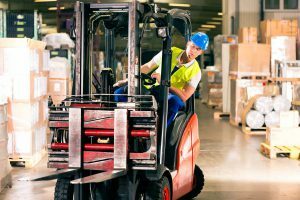 Compared to electric models, propane-powered forklifts have much higher productivity, as they are able to operate at a faster rate. This is especially important for outdoor use. When it comes to maintenance, a quick and painless propane cylinder change can be quicker than changing out a battery for an electric-powered model—putting your machinery back to work without costly delays. When you opt for propane, you will also save money on maintenance costs, as propane-powered forklifts have much lower overall maintenance costs than those operating with diesel or gasoline fuel. In fact, propane engines can oftentimes last two times longer than gasoline engines. If your business is looking for a green alternative to forklifts powered by gasoline, diesel, and electricity, propane is the best solution, as propane produces less emissions than all three of these other fuel options. In fact, forklifts powered by propane create 19% less emissions than their gasoline-fueled counterparts and 7% less emissions than forklifts powered by diesel fuel. And, when factoring in all “site-to-source” emissions, forklifts powered by propane emit fewer pollutants than those powered by electricity. Since forklifts and other industrial vehicles are often operated inside of warehouses and factories, air quality is an important factor, making propane a safer choice than gasoline or diesel. Unlike diesel, propane does not contaminate the soil and water in our communities or release carcinogens into our air. You can learn more about the many environmental benefits of this green fuel option in this video. When you choose propane to operate your industrial machinery, you are opting for an American-made fuel option that will reduce our nation’s dependence on foreign oil while also creating jobs in the domestic energy sector. Currently, the majority of the propane used by Americans is both produced and distributed within our internal infrastructure, with over 70 percent of propane used within the United States sourced from domestic natural gas. According to the U.S. Department of Energy’s Office of Energy Efficiency & Renewable Energy opting for propane fuel instead of traditional petroleum is an important step in diversifying transportation fuels within the nation and increasing our energy security. Ready to Switch to Propane-Powered Forklifts? Are you ready to make the switch to a clean source of power that will save your business money and contribute to energy security for the country? If so, Lin Gas is here to power your industrial machinery with our propane service powering Kentucky, Indiana, Illinois, and Tennessee. We have locations in many areas, including Henderson, Bicknell, Livermore, Elkton, Evansville, Dale, and Princeton. Contact us to today to learn more about fueling your forklifts with propane.